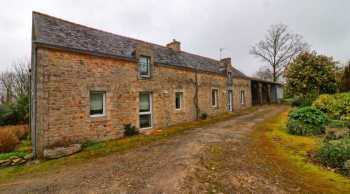 Properties for sale in Brittany, France - AHIB-2-DN-695 BAUD 56150 3 bedroomed farmhouse with pretty 2 acre garden, open fronted hangar/garage with a small workshop and a horse box. Situated at the end of a lane in the countryside or Guenin, between the towns of Locminé and Baud, a lovely example of a Breton farmhouse, fully renovated, but with scope for more. Nice spacious rooms and set in over 2 acres of garden. The house itself dates back to about 1900 and was fully renovated in 2000. It now offers you on the ground floor: a large living room/diner with granite fire place and beamed ceiling, then you have a fully fitted kitchen, laundry/boot room and a toilet. To the other side of the lounge you have a large corridor area, the large downstairs bedroom, a bathroom and a second toilet. Then upstairs to one side you have a massive bedroom, and to the other a loft room which leads to another massive bedroom. All depends on what you are looking for, but the upstairs bedrooms could easily convert to two spacious ensuite rooms or divide up into several different rooms. 160m2. Adjoining the house is a large open fronted hangar which is used as a garage with a small workshop and a horse box. Admittedly there is a slight road noise from the nearby dual carriageway, but nothing overly worrying. Fireplace, Double glazing, Internet, Car port.